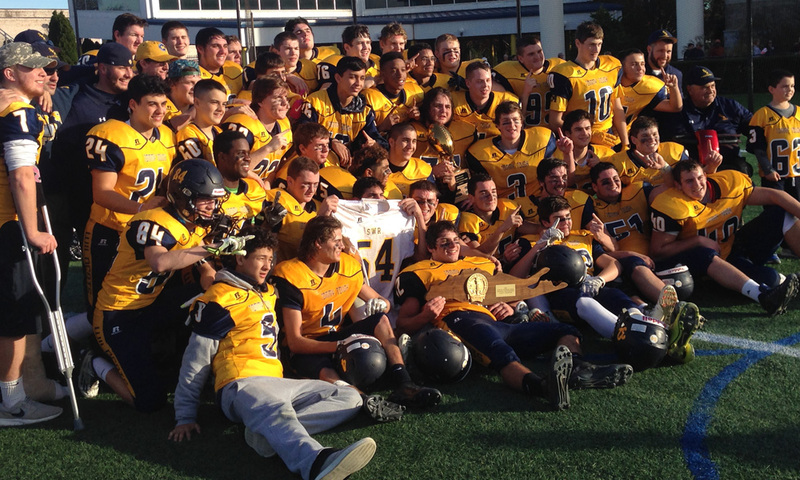 With the perfect ending to another perfect season, the Shoreham-Wading River High School football team finished at the head of the class. For the second year in a row, the Wildcats ended up as Long Island champions. Chris Rosati ran for four touchdowns as the Wildcats romped, 37-7, over Locust Valley in the Class IV final on Friday. It was the 24th consecutive win for the Wildcats (12-0). The Wildcats took charge from the start, with Rosati scoring touchdowns on three of their first four possessions against previously unbeaten Locust Valley (11-1) at Hofstra University’s James M. Shuart Stadium. Locust Valley, which defeated Seaford in the Nassau Conference IV final for its first conference title since 1987, made its first appearance in a Long Island final. It was Shoreham’s return to the Long Island title game. Last year the Wildcats made an emotion-charged march to their first Long Island championship following the death during the season of one of their players, Tom Cutinella, whose No. 54 uniform number was retired by the school. Cutinella’s presence is still felt and his memory remains a motivation. A sign hanging from the stands behind the Shoreham bench read, “54 FOREVER IN OUR HEARTS.” No. 54, Tom Cutinella, was listed on the Shoreham roster in the official game program, and his name was announced along with the other Wildcats before the game. As expected, the Wildcats came out with a heavy dose of Rosati, the prolific running back who runs with speed and power. The senior was seen limping at times with a bothersome hip, but that didn’t prevent him from gobbling up 110 yards on 19 carries. Shoreham’s coach, Matt Millheiser, tried to lessen the load on Rosati, who carried the ball only six times in the second half. But two other seniors, Jon Constant and Jason Curran, picked up the slack, running for 93 and 91 yards, respectively. Constant played possibly the best game of his career, with 140 all-purpose yards. In addition catching a 6-yard touchdown pass from Curran, Constant also intercepted two passes and led his side with six and a half tackles. Rosati also had an interception, one of four turnovers by Locust Valley. Like Shoreham, Locust Valley had entered the game undefeated, outscoring opponents by 393-56. But the Falcons ran into a force they had not encountered earlier in the season. The Wildcats became the first team to score five times against the Falcons, amassing 304 total yards in the game. After falling into a 28-0 hole by halftime, Locust Valley drove the ball to the Shoreham 1-yard line before fumbling. Shoreham’s Chris Gray came up with the ball. But the Falcons engineered a 12-play, 68-yard drive on their next offensive series, ending with a 5-yard touchdown pass from Tyler Liantonio to Owen Trepeta. The Wildcats responded with a drive of their own, and Rosati’s fourth touchdown of the game and 30th of the year. He became the 15th player to score four touchdowns in a Long Island championship game. It was a fitting finish for the elusive back, who totaled 1,470 rushing yards from 159 carries this year. Tom Talenti ran for 96 yards for Locust Valley. Trepeta made a game-high 10 tackles.